.. In 1870 the site was deeded to the Methodist congregation (and perhaps their original Fire Place Methodist church structure on South Country road moved to the site). In 1897 the church received extensive renovations and it was rededicated as a new church. In 1945 the building was deeded to the South Haven Presbyterian church following the merger of the Brookhaven Methodists with their sister church in Bellport. The Presbyterians used the structure as their principal meeting house until the old South Haven church building was moved to its present site in Brookhaven hamlet in 1961. In 1964, the old Methodist church building was sold to artist Phillip Read. In 1984, Read sold the property to the artist Malcolm Morley; while maintaining the essential character of the old church building, Morley made several additions to the structure. This document is Brookhaven/South Haven Historic Sited Datasheet Br29C. .. Blair and Joan Munhofen completed construction this house in 1955 shortly after he accepted a position at the Brookhaven National Laboratory (1953), on a lot adjacent and east of Joan's brother's house. They lived there until after he retired and moved to the Carolina's. Blair was known for his meticulous care of the house and grounds. After a couple of ownership flips, the new owner repainted the house and gate black. .. This house was built by Edna Woolman Chase, editor of Vogue Magazine in the 1920s after she had spent summers in a boarding house on Beaver Dam Road. Later it was occupied by the prominent surgeon Dr. Frederic W. Bancroft of New York City. This document is the Brookhaven/South Haven Site Datasheet Br05A on the house, and includes photographs. .. this document is the Brookhaven/South Haven Historic Structures Data Sheet (ID Br9E) for this site. A modern map indicating the extent of the first land purchases which later became the Hamlets of Brookhaven and South Haven - the "Old Purchase at South" in 1664 and "Yamphank Neck" in 1688. This map indicates the approximate boundaries of Dayton's Neck and Tar Men's Neck,* Hamlet of Brookhaven, Brookhaven Town, Suffolk County, NY. It is overlaid on a modern map of the area. In 1678, Samuel Dayton received a grant of forty acres from the Town of Brookhaven on what was to become known as Dayton's Neck. He also received a portion of the small neck known as Tar Men's Neck. Dayton's Neck is located between Mott's Creek, the eastern boundary of the Village of Bellport, and a small marshy hollow known as Clam Hollow. He moved his family from his home lot in the founding community of Setauket, on the north shore, to his new homestead on the south shore. While the exact location of this homestead is not known, some suggest that it was near the site of the George Washington Lodge on South Country Road. He and his family are generally considered to have been the first permanent European settlers in the Bellport/Brookhaven area. At the same time, the Town also granted Samuel Dayton an allotment of land near the apparently by then abandoned Tar Men's house on Tar Men's Neck—the small neck to the east of Dayton's Neck, between Dayton's Neck and Fire Place Neck. This house was apparently a temporary dwelling used by workers who harvested pitch pine sap used in the production of turpentine and lubricants. Tar Men's Neck is located between Clam Hollow on the west and Beaver Dam Creek on the east. * Broadly speaking, a neck of land is a narrow piece of land that comes out of a wider part, usually synonymous with an isthmus. On Long Island, especially along the south shore, land parcels were frequently defined as being "necks," their east-west boundaries being small bays, streams or swamps flowing into the larger southern bay. This is segment of a tracing of a map of the Town of Brookhaven originally prepared in 1797 by Isaac Hulse. The full tracing is in the South Country Library, Bellport, NY. Copies of the map may also be viewed at the Town of Brookhaven's Historian's office. This segment shows Fire Place, South Haven, and vicinity. The Carman's Mills at South Haven are at the center. This is a cropped section of a large wall map published in 1815 which shows South Haven (labeled Carmans) at the center. It's interesting to note the confluence of roads on little South Haven, and the absence of many prominent community names such as Bellport, Patchogue, and Yaphank. South Haven not only was the site for the important Carman's Mills, a commercial center, and the South Haven Presbyterian Parish, but it was also the only "goin' over" of the Carman's River on the south shore. 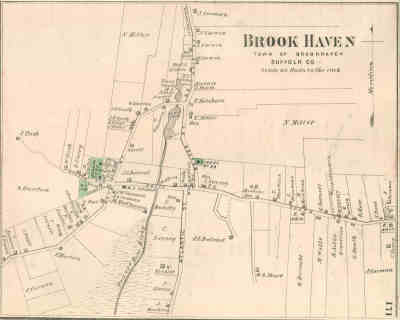 .. on this modern map is overlaid a portion of an 1839 Town of Brookhaven survey which shows a portion of South Country road in Brookhaven Hamlet. This survey was recorded in the Records of the Town of Brookhaven. It apparently was authorized by the Town to clarify the lots of the Great and Little Division made in 1733 at "South." 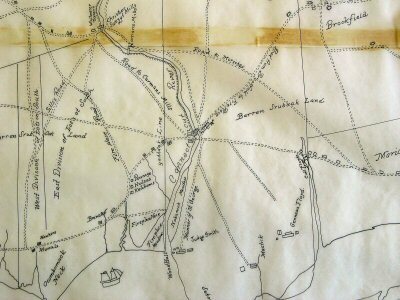 The portion of the full survey shown here shows South Country road from the "Yaphank Line" westward to Ellison's Swamp. Ellison's Swamp contains the headwaters of Beaver Dam creek. "Ellison" was likely Robert Ellison. The Yaphank Line is a survey line that runs north from the headwaters of Yaphank creek to where it intersects the Carman's River near the hamlet of Yaphank. This line crosses the South Country road (Montauk highway) at the western intersection with Old South Country road. This line was the eastern edge of the Great Division, and defined in part the western boundary of the original Manor of St. George. Of particular note here is that this survey mentions and more or less defines the location of Rev. Nathaniel Hawkins homestead situated on the south side South Country road. This residence is no longer extent, although evidence of Hawkins family cemetery remains. Also of note is that the survey defines the original intersection of the Old Town road with the South Country road to travel east. Old Town road, as it was originally laid out by the Town, stretched from Setauket at the north southward to the Great South Bay at Brookhaven hamlet (Fire Place). At Brookhaven it intersected with an east-west road (South Country road); this intersection (to travel east) was in the northern portion of the Brookhaven hamlet. The intersection to travel west was further south (at the "36" route marker, bottom of this map). 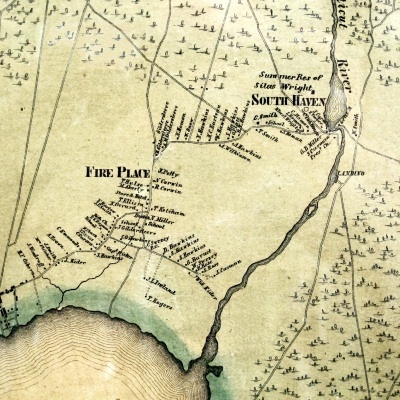 .. the map shown here as a section of a large wall map that may be found at the Suffolk County Historic Society, Riverhead, NY. It identifies individual residencies. .. 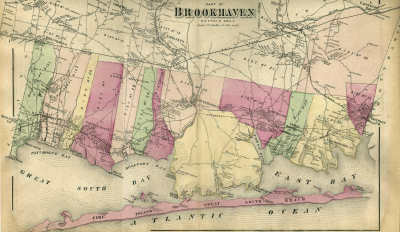 This is an 1873 map of southern Town of Brookhaven. The solid curving line running west-east at the bottom of the map is the proposed path of the South Side Railroad extension from Patchogue to Eastport, later to become the Long Island Rail Road. The actual tracks were not laid along this path when constructed in 1879-1881, but in a slightly more northerly, nearly straight-line path without the curve south into the center of Bellport Village. Montauk Hwy. was then built adjacent to the railroad, bypassing the Village. .. Article confirms Fairchild residency in Brookhaven Hamlet at least in 1887 & 1888, likely at the South Country Road residence that would later be known as Washington Lodge. 1890 District 16 School Children from Suffolk County New York, with School Teacher, Richard M. Bayles, Jr.
.. from site Sweezey.com. Celia Swezey middle of picture. It is not certain that this newspaper reference is for the building that was to become known as the Washington Lodge in Brookhaven Hamlet just to the east of the Village of Bellport, often erroneously referred to as Bellport, or another residence in the Village of Bellport. .. In addition, he buys one acre on Brookhaven road (now Beaver Dam road). The nine acres lot likely was the Lodge residence site; The one acre lot was likely where the three factory worker houses (ID Br10.12-S) were to be built. .. George Washington's younger sister and family maintain residence at the George Washington estate from June 1938 to March 1943. .. Proposing to use it as a children camp. .. Beaver Dam Creek Partnership of the Post-Morrow Foundation, Brookhaven Town, and Suffolk County, NY, To Jointly Purchase Environmentally Sensitive Property. .. The Marist Brothers Property (George Constant Washington estate) preserved by a joint effort of the Post Morrow Foundation, Suffolk County, and the Town of Brookhaven. .. Washington Lodge, the beloved, quirky building at 287 South Country Road in Brookhaven hamlet, has been donated to Brookhaven Town by the Post Morrow Foundation, Inc.
A resolution approved the transfer last week; the hope is that it becomes a Center for Environmental Education and Discovery, including a nature retreat center and hub for environmental classes and trail walks"
Publication: Brooklyn Eagle, 10 June 1896. Page 1. The missing bone in his scull is noted on George Tooker, Sr.'s WWI draft registration card. .. This August 1946 article in the Long Island Forum by Clarence Ashton Wood is a more or less modern account of this tragedy. Editors note: "Although the Forum from time to time has carried brief references to the incident here described, we believe this to be the most complete account yet given. That it is by an author whose high regard for facts is well established lends authenticity, we feel to the data here presented." ... This is a Google Books preview of Garver's book. As such, pages are missing. Even so, the color reproductions capture the luminous quality of the artist's work in egg tempera, and his meticulous painting technique is described in detail through an intimate look into Tooker's studio. 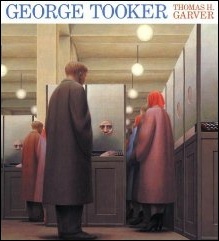 For more than forty-five years Tooker has painted haunting psychological landscapes that explore the human condition of modern society, all characterized by mystery, magic, ambiguity, symbolism, classical form, and masterful technique. The absorbing images both enchant and repel us in their forceful depiction of the complexities of our age while clearly demonstrating the artist's love of composition and human form. The Little Review, edited by Margaret Anderson and Jane Heap. .. in the 1910s and '20s, The Little Review was the most influential literary magazine in the world. At this site is information about and links to the works of some of the writers and texts The Little Review introduced to the world, most famously James Joyce's Ulysses, for which the editors, Margaret Anderson and Jane Heap, were prosecuted and fined for obscenity.